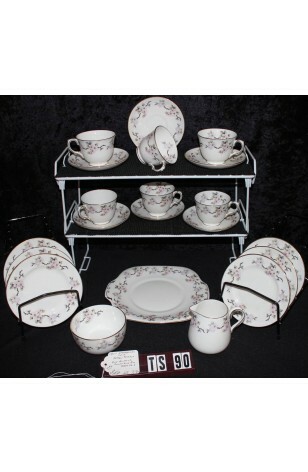 Vintage - Crown Staffordshire Fine Bone China. Pattern #F16520 - Made in England from the 1930's - Totaling (20) Pieces. Crown Staffordshire Porcelain Co. was in business from 1833 thru 1985, and made some of the most beautifully decorated China. This Particular Set consists of gorgeous Pink Cherry Blossoms, Green Leaves and Brown Branches, on the Lip of White Background China Pieces. All Items are Trimmed in 22kt Gold on all Rims, and on Handles of the Cups and Creamer, as well as the Foot of each Cup. 6 - Bread/Dessert/Tea Plates - 6 1/4"